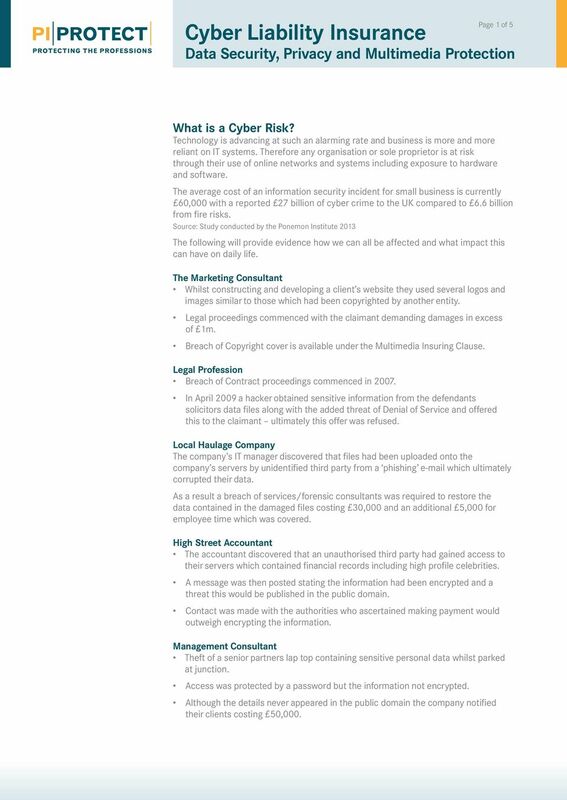 Download "Cyber Liability Insurance Data Security, Privacy and Multimedia Protection"
1 Page 1 of 5 Cyber Liability Insurance Data Security, Privacy and Multimedia Protection What is a Cyber Risk? Technology is advancing at such an alarming rate and business is more and more reliant on IT systems. Therefore any organisation or sole proprietor is at risk through their use of online networks and systems including exposure to hardware and software. The average cost of an information security incident for small business is currently 60,000 with a reported 27 billion of cyber crime to the UK compared to 6.6 billion from fire risks. Source: Study conducted by the Ponemon Institute 2013 The following will provide evidence how we can all be affected and what impact this can have on daily life. The Marketing Consultant Whilst constructing and developing a client s website they used several logos and images similar to those which had been copyrighted by another entity. Legal proceedings commenced with the claimant demanding damages in excess of 1m. Breach of Copyright cover is available under the Multimedia Insuring Clause. Legal Profession Breach of Contract proceedings commenced in In April 2009 a hacker obtained sensitive information from the defendants solicitors data files along with the added threat of Denial of Service and offered this to the claimant ultimately this offer was refused. Local Haulage Company The company s IT manager discovered that files had been uploaded onto the company s servers by unidentified third party from a phishing which ultimately corrupted their data. As a result a breach of services/forensic consultants was required to restore the data contained in the damaged files costing 30,000 and an additional 5,000 for employee time which was covered. High Street Accountant The accountant discovered that an unauthorised third party had gained access to their servers which contained financial records including high profile celebrities. A message was then posted stating the information had been encrypted and a threat this would be published in the public domain. Contact was made with the authorities who ascertained making payment would outweigh encrypting the information. Management Consultant Theft of a senior partners lap top containing sensitive personal data whilst parked at junction. Access was protected by a password but the information not encrypted. Although the details never appeared in the public domain the company notified their clients costing 50,000. 4 Page 4 of 5 Step 2: Please complete the details below regarding the Insured/Proposer Name of Insured/Proposer Full address of Insured/Proposer Company Number Annual turnover/income (for most recent 12 months, or as projected for new businesses) Step 3: Please confirm that the Insured/Proposer and its subsidiaries: 1 Is all personally identifiable and confidential information that is removed from the Insured s premises in any electronic format encrypted? Yes No If not, then Unencrypted Portable Media Device Exclusion to apply. 2 Does the Insured regularly update (at least monthly) antivirus software and firewalls in place within their networks? Yes No If not, then the proposed insurance will be declined. 3 Does the Insured have a Business Continuity Plan in place that is tested annually, and can the Insured confirm that their systems can be back up and running within 12 hours of a breach? Yes No If not, the BI section is deleted. 4 Is the Insured PCI (Payment Card Industry) compliant? Yes No N/A 5 Has the Insured recently carried out an IT security audit and effected all recommendations and requirements from this? 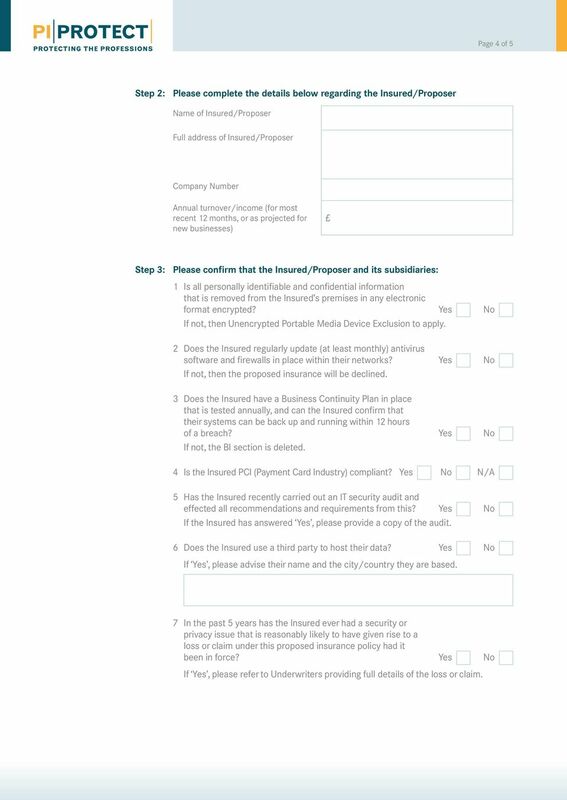 Yes No If the Insured has answered Yes, please provide a copy of the audit. 6 Does the Insured use a third party to host their data? Yes No If Yes, please advise their name and the city/country they are based. 7 In the past 5 years has the Insured ever had a security or privacy issue that is reasonably likely to have given rise to a loss or claim under this proposed insurance policy had it been in force? Yes No If Yes, please refer to Underwriters providing full details of the loss or claim. CPM INSURANCE FOR CYBER, PRIVACY & MEDIA RISKS Esurance TM CPM Application Form This is an application for a cyber, privacy and media liability package policy aimed at a wide range of companies and professionals. Network Security ProPosal Form Important Please answer all questions from each section and complete in block capitals. 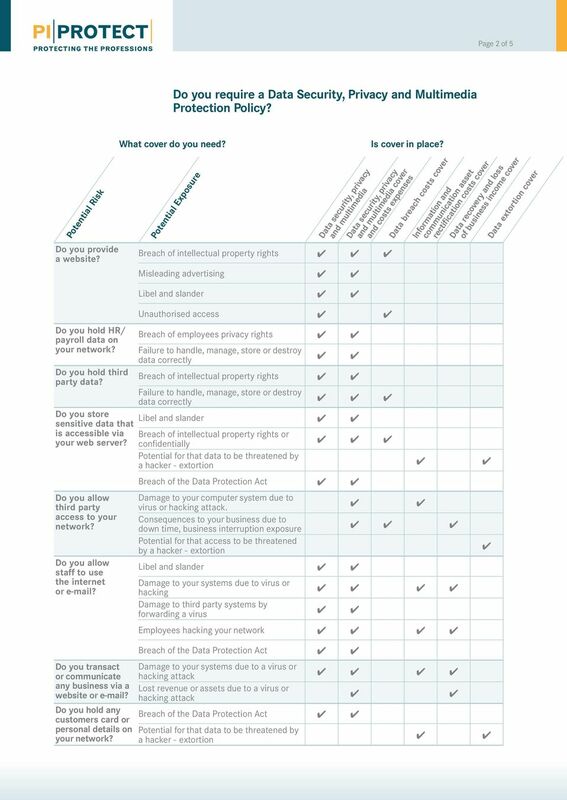 Tick the appropriate boxes where necessary and supply any further information requested. CPM INSURANCE FOR CYBER, PRIVACY & MEDIA RISKS Esurance CPM Application Form This is an application for a cyber, privacy and media liability package policy aimed at a wide range of companies and professionals. 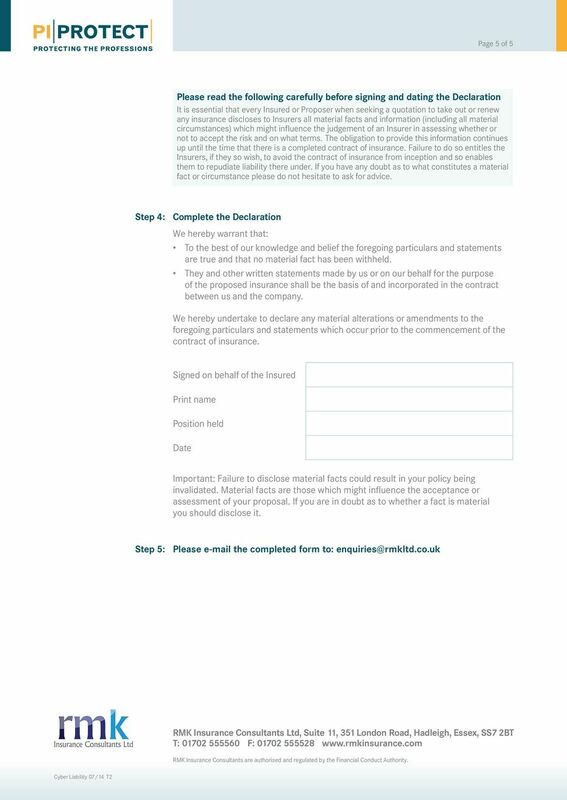 Proposal Public & Products Liability This proposal must be signed on the declaration page by the insured or a person employed and/or authorised by the insured. This form is not valid if signed by a broker. 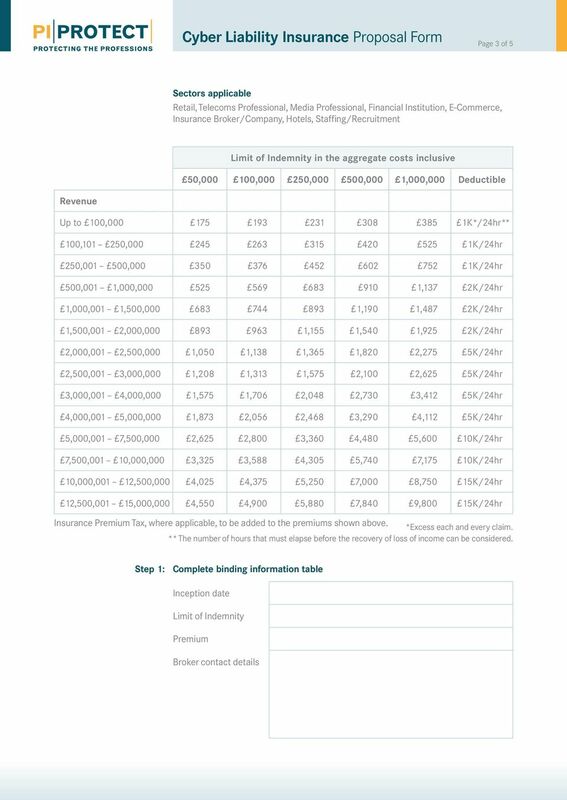 Firm Registration Form Firm Registration Form This registration form should be completed by firms who are authorised and regulated by the Financial Conduct Authority. All sections of this form are mandatory. (c) MySite Design will make my web pages and electronic newsletters available on the internet only after I make payment for their services. MISCELLANEOUS E&O APPLICATION FOR MISCELLANEOUS PROFESSIONAL LIABILITY INSURANCE WITH CERTAIN UNDERWRITERS AT LLOYD S THIS APPLICATION IS FOR A CLAIMS MADE INSURANCE POLICY APPLICANT S INSTRUCTIONS 1.